Mike is all smiles on August 19, 2010 during FPB's gig in Yorville, NY. Fritz is shown here on August 19th at FPB's gig in Yorkville, NY. 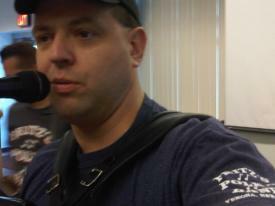 Mike is pictured here during FPB's gig on August 17, 2010 in Utica, NY. 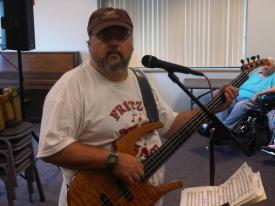 Gabe is pictured here during FPB's gig at the St. Luke's Home on August 17th. Fritz and (part of) Rocko Dorsey (special guest for this gig) are pictured here on August 17th during FPB's evening gig at the St. Luke's Home. Fritz is pictured here during FPB's gig at the Sherrill-Kenwood Park fundraiser on August 14th. Frank and Gabe are shown in deep concentration on August 14, 2010 in Sherrill, NY. Mike keeps the beat during FPB's gig at the Sherrill-Kenwood Park fundraiser in Sherrill, NY on August 14th. Gabe gets his amps dialed in on August 14th in Sherrill, NY. Gabe belts out a tune as he plays his Parker six string on August 11th in Rome, NY. Rocko Dorsey (special guest for this gig) and Fritz are shown during FPB's gig at the Rome Summer Concert Series on August 11, 2010 in Rome, NY. 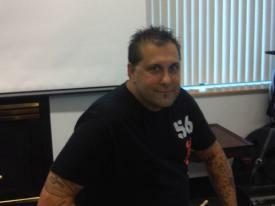 Mike is shown here on August 11th during FPB's gig in Rome, NY. FPB Fan Club Member, Betty Miller was a special guest on a few tunes during FPB's gig in Rome, NY on August 11th. She's pictured here with Fritz. Frank and his Fender on August 11th during FPB's gig in Rome, NY. Mike and Gabe are pictured here during FPB's gig at the Rome Summer Concert Series on August 11, 2010.